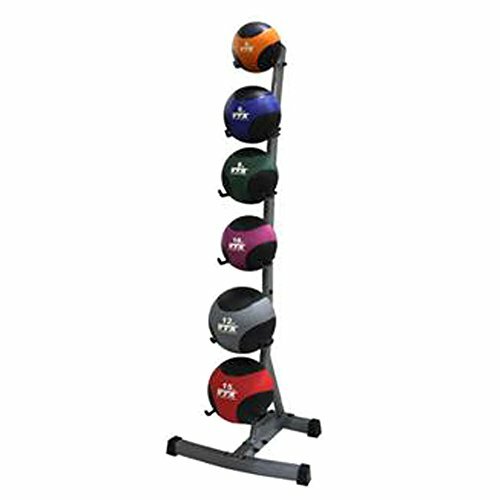 Get commercial-grade storage right in your home gym with the VTX by Troy Barbell Medicine Ball Rack. Made of institutional-grade steel, it features a tower design that can hold up to six medicine balls. About Troy Barbell: Since 1987, Troy Barbell has been developing and manufacturing free weights and fitness equipment while providing unparalleled quality, service, and satisfaction to its growing customer base. Today, the Houston-based company is one of the top free-weight manufacturers in the industry with a diverse range of products and a full commitment to use only the highest grade materials and designs. The Troy family consists of three lines: USA, leading-quality home fitness; VTX, committed to specialty and training applications; and Troy, the premium line of free-weight equipment for commercial and institutional use. Institutional-grade steel frame. Tower-style medicine ball rack. Holds up to 6 medicine balls. Dimensions: 14L x6W x 64H inches. 1-year manufacturer's warranty. If you have any questions about this product by VTX, contact us by completing and submitting the form below. If you are looking for a specif part number, please include it with your message.